J. R. Betts book tells the fascinating story of how this extraordinary event took place in 1905, tracing events from from the Northamptonshire village of Raunds and its local and national impact. 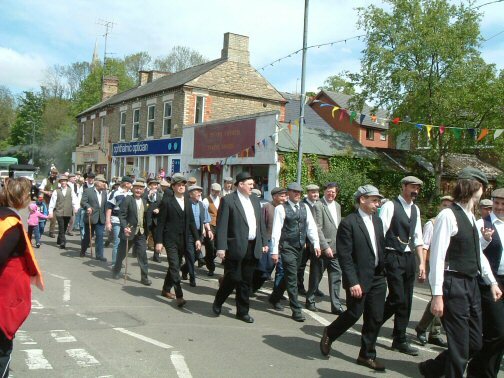 In 1905, a strike was organised in an attempt to gain better wages, which led to the ‘Raunds Riots’ which saw some 500 – 600 people gather to jeer at the strike breakers with cries of ‘blacklegs’ and ‘traitors’. Nearly every window of the homes of the non-strikers were smashed by the mob. As the strike dragged on, the War Office held firm, and soon the strike was broken with the employees returning to work no better than before the strike. 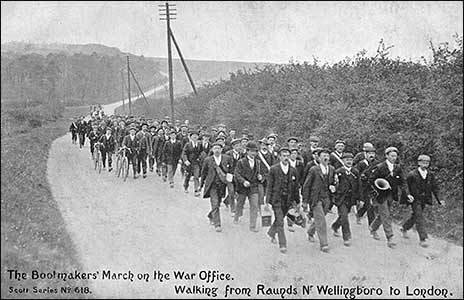 This led to local councillor James Gribble, an ex military man dubbed ‘General Gribble’ organising a march of 115 men representing a regular army unit to highlight the plight of the shoe-workers. The marchers comprised a Paymaster, Billetmaster, Commissariat-General, five companies with respective sergeants, a marching band of eleven men and an advance cycle corps of three. 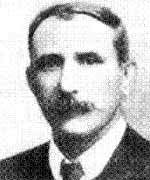 Gribble’s intention was to present their case to the War Office. As the march progressed, without backing of the union it must be noted, it became increasingly successful in capturing the media and general public attention. Crowds turned out in force to cheer on the marchers on their way to the capital as they passed through Rushden, Bedford, Luton, Harpenden, St. Albans and Watford. Although the marchers were prevented from marching to the Houses of Parliament, a crowd of c. 10,000 assembled to greet them in Hyde Park, and on the following day a demonstration was held in Trafalgar Square with Keir Hardie, founder of the Labour Party, speaking on the workers behalf to the assembled crowd. Gribble attempted to raise the shoe-workers case in the House of Commons but was ejected from the building following an impatient outburst, which attracted national media coverage nonetheless. The men marched all the way back to Raunds, taking a different route. J. R. Betts notes that a crowd of 5,000 gathered at the Square in Raunds to welcome home the marchers, a crowd that was larger than the town’s population at that time. The impact of the Raunds March remains a matter of debate, however did successfully raise awareness of the plight of the boot and shoe-workers both nationally and internationally, ultimately leading to negotiations between the War Office and unions that resulted in the setting up of the Board of Conciliation and Arbitration, which helped reduce future price fluctuations. The anniversary fell on a beautifully sunny and mild Spring day. 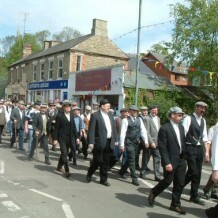 There was a re-enactment of the march, with 115 local people dressed in the clothes of the time, with accompanying brass band, cyclists on antique bikes and a cavalcade of steam driven vehicles and floats. There was an extremely good turnout of local people. The march didn’t quite get to London and back, but made do with venturing from the outskirts of Raunds, past the town square and to Saxon Hall. Local dignitaries then marked the occasion of the anniversary unveiling a special plaque commemorating the event which can be found adjacent to the Town Hall. 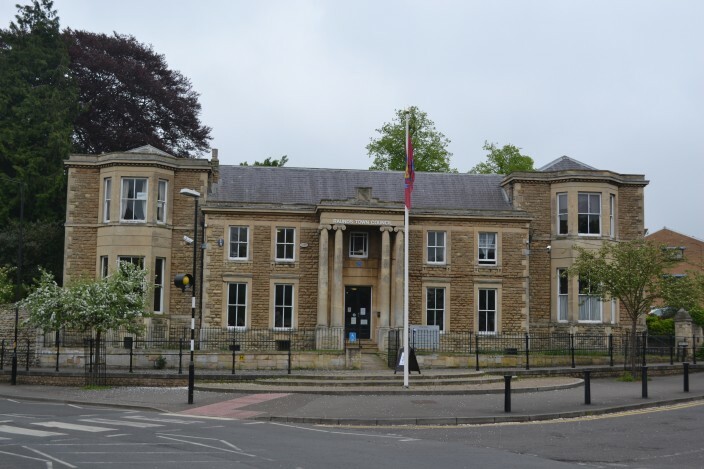 The Town Hall is also a remnant of the town’s former boot and shoe-making heritage as it was the former residence of local shoe-maker John Knighton Nicolls, brother of William Nichols, the first large-scale boot and shoe manufacturer in Raunds. This page was added on 24/05/2013.